Baffled by web developers’ jargon? Maybe creative designers don’t understand the needs of your business? If you want to improve your website and you’re looking for someone to help who talks your language, give us a call. 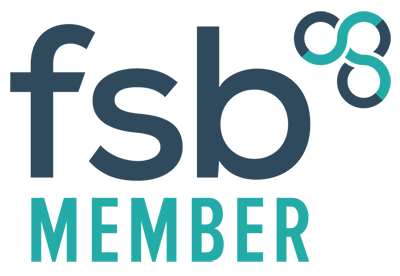 We build and maintain business websites in the New Forest, Hampshire, Dorset and beyond. Updates to existing websites – not happy with the service from your current website provider? We’ll take on the maintenance or development of most existing websites. You can choose from a set of fixed price modules. Select the best combination for your needs and budget. Your new website can be maintained with a support package after it has gone live. Most of our customers opt to have our full technical support package, which gives them a fixed monthly cost with the assurance that they can call on us for support at any time. Call us on 023 8028 3452 or 07749 797005, or drop us an email to find out how you could have a better business website. 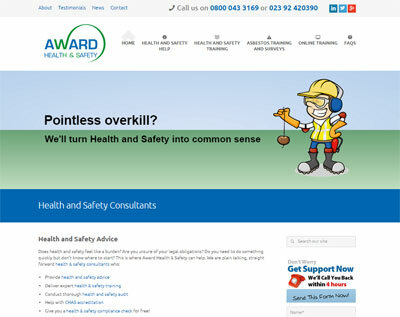 Award Health and Safety wanted to make their website more welcoming for first-time visitors. They also wished to replace an outdated content management system. Award conveyed the message that Health and Safety needn't be dull and intimidating by using friendly cartoons and quirky photos and captions. The use of animated slides adds visual interest. This website also includes a blog. With a little training from us on Search Engine Optimisation, Award are achieving a good search engine position thanks to regular well optimised blog posts. We also helped them set up an email newsletter which they are sending out regularly to drive traffic to their blog posts.